Atoms, or elements, are the smallest unit of matter. They retain their identity in chemical reactions and are combined to form compounds and everything in the universe. Atoms have some basic parts. Protons and Neutrons are found in the nucleus and make up the atomic mass. To find the number of neutrons, you subtract the atomic number (number of protons) from the atomic mass number (protons plus neutrons). Electrons are so tiny that they do not influence the atomic mass. They are found orbiting the nucleus in shells or orbitals. Atoms are neutral so the number of protons equals the number of electrons. How small is an atom? Watch this entertaining TedEd video! Mendeleev designed the periodic table by looking at the properties of elements on cards and arranging them different ways until he got a system that worked. No one told him how to do it, he just did it until it worked. He even left spaces for elements that were discovered in his lifetime. 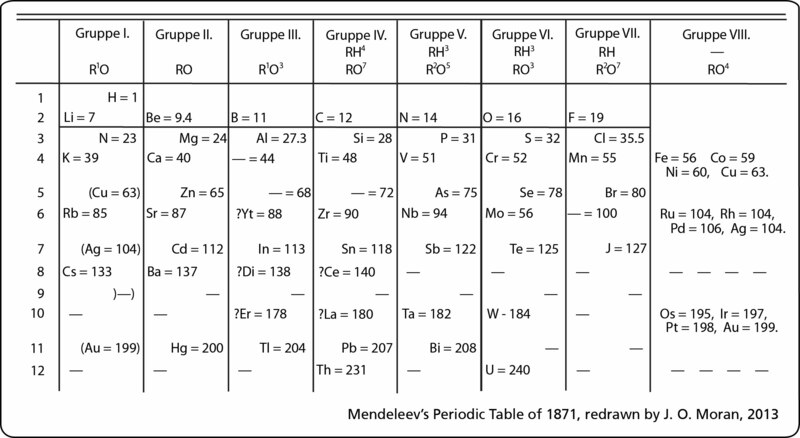 (More info about Mendeleev) His periodic table was set up according to atomic mass number. The current table, altered slightly by Moseley, is organized by atomic number (number of protons). This is an AMAZING Video about Mendeleev and his PT! Next we discussed regions of the periodic table, colored them, and labeled them. Periods are horizontal rows (periods go at the end of a sentence) and there are 7 periods. There are 18 groups or families (vertical columns) and a few of them have special names. This a pretty excellent diagram. This website gives a lot of helpful information.